Syfy is giving me a complex with it's increasingly bizarre mutant creations that languish in the deep, dark, mysterious depths of whatever watery hellholes they emerged from. I found myself thinking like Chief Brody from Jaws as I stopped to wonder about the logistics of fighting such a creature on my beach vacation next week. As I watched the clips from the upcoming Swamp Shark I was asked by one of my kids if such a creature could exist and if it did would it eat us? I thought that I detected a hint of humorous malevolence in their tone so I decided to let them sit with me on Saturday at 9:00 PM EST to get an eyeful of what a shark on a mission can do to throngs of innocent people attending Gator Fest looking for a good party. We recently had the chance to attend the Swamp Shark press conference with all the the movies stars on one panel and this is what they said. When asked how each of the stars got involved with this project..
Kristy Swanson: Robert, do you want to start? Robert Davi: Well I got a phone call from the agent and they said “hey, there’s a Syfy movie called Swamp Shark. So I was immediately intrigued by the title because I have a ten year old boy who all we do on YouTube is look for shark images. Him and his ten year old friends gather around that computer and go “wow look at this one!” So I heard Swamp shark and I said “send me the script” I then read it and it had a great location which is a great place to put a shark and I had some great ideas about the character and the directors and producers were very open to that and the process started fully. And of course there’s the beautiful Kristy Swanson..
Kristy Swanson: I also got a phone call from my agent who said to read the script and I thought that the title of it was very interesting as well and then I heard that Robert Davi was on board and I’m a big fan of his and we are good friends so I thought this would be a really good experience to work with him and be a part of the project. I really liked the character I would be playing, she’s a very strong female role and I’m always attracted to that and that’s how I got involved. D.B. Sweeney: I heard that Wade Boggs was in and I’m a big baseball fan I had all kinds of chicken rescues I wanted to try out and I had already gotten on the plane before I heard that Davi was in it and it was too late to pull out. Davi: I was already signed because when I found out D.B was in it I was gonna pull out. D.B. : No really I know Robert and Kristy and it sounded like it was going to be a lot of fun and it certainly was. I went to school in Louisiana for awhile so I love that part of the country and there were just a lot of good reasons to do it. Wade Boggs: I was at a gold tournament in Orlando with Jeff Chase and and he plays the Swamp Thing and he asked if I’d be interested in doing a part in a movie that he was doing down in Louisiana and I said absolutely. Being a baseball player you are a ham anyway and I got an opportunity to play somebody other than myself in an acting role, so I was really looking forward to it and had just an absolute blast with meeting Robert, D.B. and Kristy, the whole cast. It was really a special opportunity for me. When asked about the similarities between the zone inside the batters box and the zone of acting..
Wade Boggs: Actually I think they are somewhat different. I know that the concentration has to be exactly the same. You have to portray an individual and people have to believe that and I think being an athlete you don’t have the opportunity to say “cut, take two” you either strike out or put the ball in play. So , they are somewhat similar with the concentration like I said. Knowing your lines and coming across the right way. To have the druthers I have I just love acting and being a baseball player you are an actor too. You are playing in front of 45-50 thousand people every night so you’re on stage. That’s the acting bug that comes out in you. 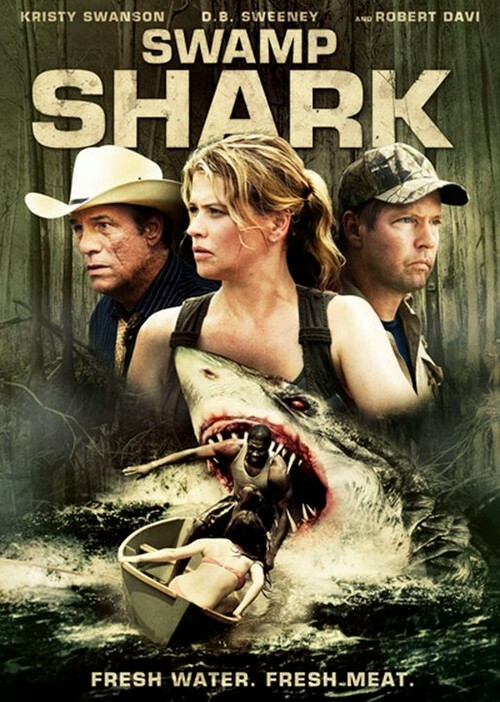 When asked how Swamp Shark compares to some of the others Syfy monsters..
Kristy Swanson: Well he’s definitely a lot different looking than your normal shark but to be honest I haven’t seen all the other monsters. I’ve seen this movie and I think it’s really great , really fun and it’s got a lot of suspense and it takes place in a really beautiful part of the country and I think you’ll really enjoy it. When asked about their preference for good guy roles or bad guy roles (directed at D.B. Sweeney and Robert Davi)..
Robert Davi: Well, now I want to sing. I’m doing an album that will be out called Davi sings Sinatra and that lets me be the good guy- that’s a great way to slip in a plug. Anyway it’s fun playing all kinds of characters. As long as they’re fun and interesting, whether it’s a good guy or a bad guy. This was fun for me because I played a guy who was kind of like from back east and then moved to the bayou for the last twenty five years. I had an uncle who did that and he had the strangest accent so I kind of fashioned it after him. I’m open to all kinds of interesting characters. D.B. : I think a lot of times playing the bad guys is more fun because you’ve got to stir the pot and the protagonist often has to walk a straighter line. When you’re the bad guy anything goes. You’re not constrained in the same way as the guy who is in every scene and who the audience sort of has to root for. When asked how the acting thing came about (directed at Wade Boggs)..
Wade Boggs: My first acting gig was Cheers in 1986. I did an episode playing myself during the bar wars with Gary’s Old Town Tavern. Gary’s and Cheers were going at it and exchanging good fun and trickery. I went on to do a guest spot on The Simpson's and actually I just finished up an episode of Psych up in Vancouver about two weeks ago. I love the acting bug, once it bites you it sort of consumes you and it’s something that I’d like to pursue a little bit more not only playing myself but I like going into character. I like trying various accents and things of that nature. Trying to come up with a Louisiana Cajun accent was a little out of the ordinary but still fun. I love acting and I respect each and every actor and actress out there who does their roles well. My hats off to all of them. Kristy: And Wade? Acting loves you because you are great in the movie. 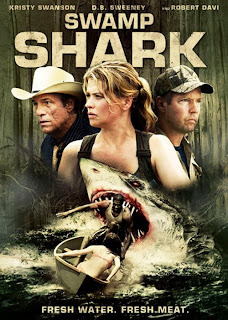 When asked about the most challenging aspect of filming Swamp Shark and the Louisiana weather..
Kristy Swanson: definitely the weather (laughter) it’s really hot in Lafayette Louisiana in June and that’s what it was last year. It was SO hot, definitely challenging. There was the heat and working on boats and near the water is always a challenge so that was the toughest for me. Robert Davi: For me it was staying away from that great Cajun food let me tell you. They had some great craw fish down there and the etouffee and all that other good stuff and everything is fried. I love the heat and I love the humidity even though it was tough because it’s part of the character you know? You’re trying to meld into that and anytime an actor can have a condition it’s good. Like in Stargate Atlantis we had these scenes where we in this terrible rain, it was horrific but I enjoyed it because you’re in the elements you don’t have to act it , it’s there. This whole experience this gorgeousness of the bayou was great. We had a terrific director and producer who made things as comfortable as possible for us down there. It was a blast. Wade: I was inside the jail and as far as I was concerned it was 125 degrees in there and probably the most difficult part was keeping my make up on. Robert Davi : You wore make up Wade? Wade: Absolutely. I was trying to keep the fake blood on my nose..
Robert Davi: I never thought you would wear makeup..
Wade: trying to keep that fake blood on after I got punched out by the swamp thing..
DB : I like it when they let me drive a car or motorcycle around on a blocked off road and in this case we had a great boat that I got to drive around and the biggest challenge was to drive it at really high speeds and keep Kristy from puking. Kristy: I nicknamed you Captain Crunch. DB: We were on a tight schedule and there were a lot of shots where I had to drive up to the dock and you know there’s a shark chasing after you so you can’t come in under full safety flags or anything. You’ve got to come in hot so we ran up on more than one dock. Kristy Swanson: Yeah, uh huh. Oh Wade, I just did Psych four weeks ago! Wade: Did you? Those guys are awesome! Kristy: I’m going to email them today. When asked how the rest of them got into acting..
Robert Davi : Sure, I always wanted to act as a kid and in fourth grade I did a play “George Washington Slept Here” where I played Sam the black butler. I was typecast from the beginning. It was character acting from the beginning.I then wound up really getting the bug for it and the teachers in my school were encouraging my parents to put me in the arts and I ended up in high school winning a lot of awards for dramatic interpretation and for singing and things. Got a scholarship to Hofstra and then studied with Stella Adler and then went off to the actors studio and then did my first film with Sinatra. They put me under contract to Columbia and the rest is either uphill or downhill depending how you want to look at it. D.B. : After I won American Idol it was all sort of a natural progression and I thought “I’ll just go take a job from a real actor”. Nah, I started out in New York..
Robert Davi: I missed that American Idol episode. D.B. I never thought they would let me into Hollywood moves or TV so. Robert Davi: I don’t know why they did. D.B. that’s all I had, I’m a one trick pony. Kristy Swanson: I guess my background is similar to Davi’s. I started when I was very young. I was pretty much always performing acting anything I could get my hands on when I was a little girl and then I had some friends that did commercials in Hollywood and I talked to their mom and they got their mom and my mom to talk. I said I wanted to do what those kids did on TV. My parents were school teachers they didn’t know anything about it and they really didn’t want me to get involved with it but after me persisting they decided we would send some pictures to this children's agency which is Mary O’Grady Agency . They asked me to be a client went on my first audition the next day and got the job. I was on a roll at the beginning at nine years old and I’ve just been doing that ever since. Thirty two years later it’s all I know and I love it. When asked what was everyones favorite part of working on the film was..
Kristy: My favorite part was the cast, crew and the directors and producers. Everybody involved in the project. Seeing them every day and working with them every day. We were in some extreme conditions down in the swamps with lots of bugs but everyone made it a LOT of fun and we had a lot of laughs. They always kept it upbeat. Wade Boggs: I’ll go ditto on that. When you are behind the scenes and watching how everything comes together and not really knowing what the final product is going to look like and how your segment is going to blend in with everything else because I haven’t seen the final film yet this is going all be news to me Saturday when I look at it. Robert Davi: You’re not in the picture Wade they took you out. Wade Boggs: Won’t be the first time I end up on the editing floor. But it really was a tremendous experience. Turn down the lights, pop some corn and tune into Syfy on Saturday night at 9 PM EST to see Swamp Shark.